The natives are restless. Several tribes are laying claim to a set of territory. There's only so many resources to go around, and each group wants them for themselves. There's a war on, and only one group will win. 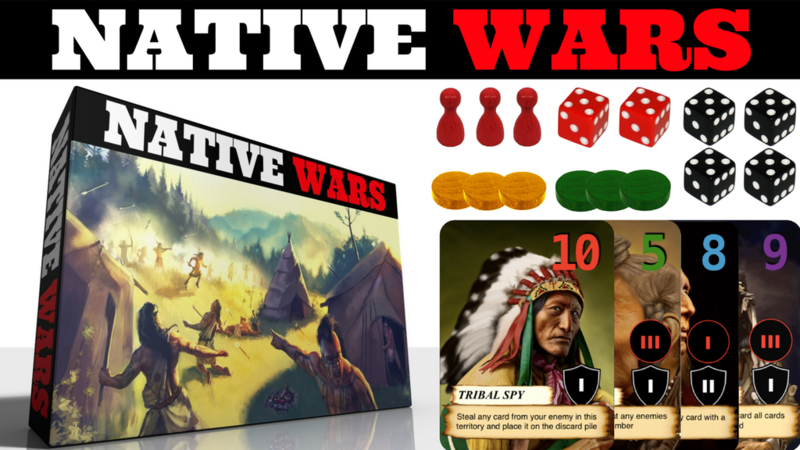 That's the story behind Native Wars, a new card game that's up on Kickstarter. Native Wars is a competitive card and dice game, where players manage their tribe decks to capture the most territories. Players' cards are numbered in which you have to roll two dice to activate them by the total sum of your roll. Their card effects guide your tactical actions in the game through manipulating cards in play, attacking the enemy, or granting war power. You want to be the first tribe to capture two out of the five territories to win the game. To do this, card placement is vital along with using your 2 actions per turn wisely. Who will you send out into the battlefield? The campaign is a bit more than 1/6 funded with still 30 days left to go.